The New York Times just posted a short article about high-intensity interval training (HIIT) –something I’m always interested in learning more about because it’s so effective and efficient. The article shares the findings of a study published in the American College of Sports Medicine’s Health & Fitness Journal, which concludes that 12 exercises deploying only body weight, a chair, and a wall constitute a HIIT workout and just take seven (uncomfortable — at a level 8 on a scale of 1-10) minutes. And according to the study authors, these precious seven minutes “produce molecular changes within muscles comparable of those of several hours of running or bike riding.” Seriously?! That’s AMAZING, totally defying everything many of us grew up thinking about exercise (i.e., more = better). We all have at least seven minutes. 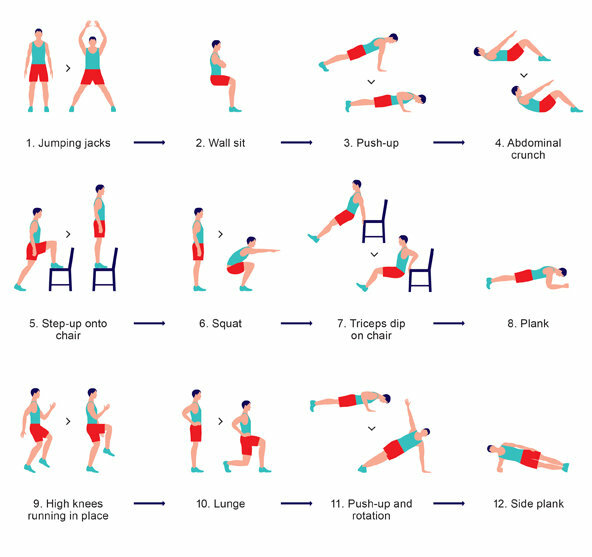 In fact, I’d argue that we all have at least 28 minutes and could do this workout multiple times during the day. Yes, a long, luxurious workout beats this any day, but time is a scarce resource these days. And if I can get seven minutes, I’ll take it — in the gym, in the garage, in a conference room with the door closed, or in the parking lot waiting to pick up my kids. Are you into HIIT, and if so, what’s your favorite workout/class? And if you haven’t tried it but would like to, check out my earlier post on Tabata and my friend Karisa’s simple-but-super-tough home workout. I think this circuit is great!